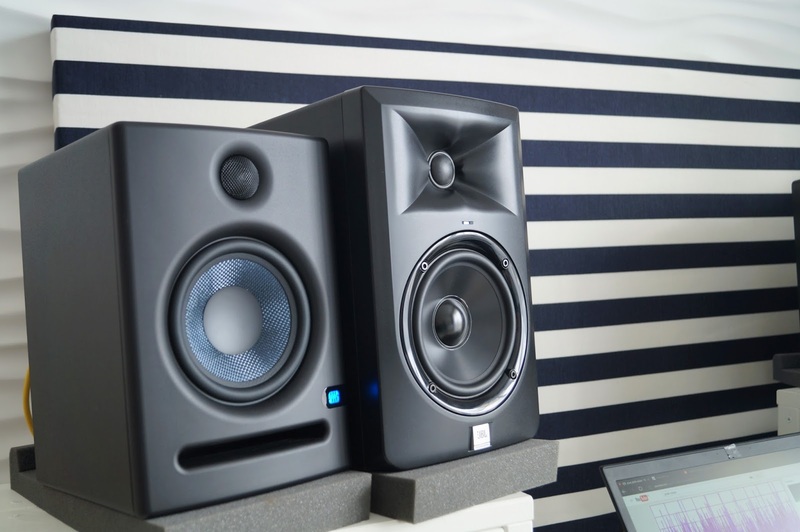 Presonus Eris E5 active monitor review. Eris E5 fights Eris E4.5 and JBL LSR305, fails to engage. About a year ago I reviewed Presonus Eris E4.5, smallest speakers of the Presonus Eris studio monitor line. I was really impressed with this rather compact speaker and decided that at some point I want to test bigger, fully active brother of E4.5 Presonus Eris E5. I was interested if it is any better than very good E4.5 and how it compares to, the best in class, JBL LSR305. Fast forward one year, and here it is, my review of Presonus Eris E5 active monitors. The first thing that struck me when I took E5 out from the boxes is that they look almost exactly like E4.5 and the difference in size between them is rather small (E5 is something like 1-2 cm bigger than E4.5 in every dimension). I expected them to be closer to JBL LSR305 sizewise, but they came out to be fairly compact with size almost exactly the same as Behringer 50USB. If You think You can squeeze E4.5's into Your desk space than You most certainly can also squeeze the E5's there as well ;) One of advantages of E5 design is the fact that they are front ported, so You can put them closer to wall than smaller E4.5 and JBL LSR305, without compromising the bass response. Build quality, fit and finish of E5 is on par with smaller brother which in itself is good news. E5 is smaller than LSR305, it is also better build and looks cleaner. I especially liked the dark blue carbon fiber woofer that gives it nice, distinctive look. It is not as eye catching as yellow cones that KRK use in their monitors, but they are enough to distinguish them from the rest of boring studio monitor crowd. I also like the blue backlit Presonus logo that lights up when the monitors are working, it is stylish and nicely subdued. Presonus Eris E5, unlike E4.5 that is in fact a passive powered design with only a stereo amplifier powering all four drivers via passive crossover, and just like the JBL LSR305, is fully active design with two amplifiers in each box. Amplifiers used have 35W for textile tweeter and 45W for woofer. This means that pair of Eris E5's (at 160W of power per pair) is over 3 times as powerful as pair of E4.5's (50W per pair), and that should give it greater headroom and less distortion. JBL LSR305 is just a touch more powerful, but it get's its power from Class D amplifiers instead of more traditional Class AB used in Eris E5. Set of inputs is typical and includes RCA unbalanced and XLR and TRS balanced inputs. Just like in E4.5, we can shape the sound of E5 using High Frequency dial (range from -6dB to +6dB), Midrange dial (-6dB to 6dB) and Acoustic Space Switch that controls low frequencies (0dB, -2dB, -4dB). Unfortunately there is no way to boost the bass response, we can only attenuate it. Why this is improtant will become clear later in the review. There is also Low Cut switch that can be used to filter the lowest frequencies below either 80Hz or 100Hz when we use E5 with subwoofer. As usual, I will start this section with report about hiss and self noise. Presonus Eris E5 is usual example at this price point. When we power the speakers they greets us with faint hiss that in most cases will not be a problem. If You, on the other hand, have very quiet room than You will be aware of E5's hiss when the music won't be playing. Level of hiss is on par with JBL LSR305 and KRK RP5 G3. Presonus Eris E4.5 is slightly quieter in this regard but still noticeable in very quiet spaces. If I had to describe sound of Eris E5 in two word it would be "precise" and "lean". Two things stuck out in E5's performance. It is a bit forward midrange and lean bass. This makes them sound a bright but they do not go as far as to be piercing or edgy. Midrange, all though a bit forward, is detailed and transparent. Voices sound very clear and natural and come a bit forward, so it is very easy to hear all their details. It works great in rock music and acoustic music. It also translates to great soundstageing with nice spread and good depth. Images are nicely focused and precise in placement. Bass on the other hand is a bit restrained and lean. It has decent reach to around 55Hz but it lacks a bit of punch and drive, especially on low levels. What it gives up in term of punch is balanced by very good detail and lack of major colorations. This kind of bass response suits E5 to smaller rooms with limited space around (front bass ports). What I would like to see is bass boost option like in most other monitors have. It would be beneficial to those wanting to use them in bigger rooms or on stands. E5 is not Your speaker if You listen to a lot of bass heavy music and craves a bit of gut massage. E5 will work great with good subwoofer though! On the other side of spectrum, top end is a bit hidden behind upper midrange but does its job with good effects. It is smooth and detailed. As I mentioned, I compared Eris E5 with smaller proposition prom Presonus, highly popular Eris E4.5, and my favorite JBL LSR305. Let's talk about comparison with smaller brother to E5, Presonus Eris E4.5. Size wise they are really close, I think they both would work as well in most situations. They also look very similar, and are built to same high quality. Soundwise E4.5 seem to be designed with focus more on pleasurable listening while E5 is more transparent, precise and faster. That is not to say E5 is unpleasant, it is just unflattering and especially shine with music that is well produced, but they also are more ruthless for music that is produced poorly (Metal music, I'm looking at You). E4.5 has more meat to it's sound. A bit of midbass boost gives it more weighty punch. It does not go as low as E5, but there is not more than 5 maybe 10 hertz of real gap between them. In reality E4.5 is more groovy, where E5 is detailed and lean. Situation changes a bit when the volume goes up, than E5 starts to work great, where E4.5 starts to sound a bit boomy. Both, E4.5 and E5, can play loud but E5 has superior headroom. Midrange is another area where Presonus brothers differ a bit. E4.5's midrange is a bit veiled and slightly slower compared to faster, cleaner and snappier midrange in E5. They both throw great soundstage, but E5 has bigger and more focused imagining, it is also a bit more 3D. All in all, E5 is less distorted and more honest speaker, yet E4.5 uses his colorations to it's advantage when it comes to enjoyment. Eris E4.5 is a worthy contender to Eris E5 considering the price difference. Eris E4.5 is a worthy contender to Eris E5, what about JBL LSR305? Let me begin saying that I like the looks and build quality of both E4.5 and E5 more than JBL. JBL is big and rather ugly where Presonus duo is more compact and cleaner looking. But anyone who can live with size and looks of JBL will be rewarded with excellent audio quality. Compared to Eris E5, JBL is more engaging and enjoyable speaker. Eris E5 is clean and honest, but a bit dry and analytical because of its slight upper midrange emphasis and rather dry bass response. JBL in my space is able to reach below 50Hz with nice punch and weight. Eris reaches down to around 55Hz, which in it self is respectable, but lack of punch and weight (especially while listening on low levels) is a bit of a letdown. There is also a hint of boomines in the mid bass regions in E5. Moving on to midrange, both LSR305 and E5 are detailed and natural here but upper midrange in E5 is more forward and more in Your face. This makes guitars to have more crunch and snares snappier. LSR305 on the other hand has midrange more rich in tones and details without pushing it forward Top end in both speakers is well connected with the rest ot the spectrum but JBL seem to be more extended and airy. Soundstage is good on both with slight edge on JBL's side. So in summary, if You look for enjoyable, yet detailed and natural sounding monitor, than go for JBL. Presonus Eris E5 is a competent monitor that failed to connect with my emotions. It has honest, if a bit analytical, sound that is much better suited for music mixing and production (duh), than is for listening pleasure. Kinda have to disagree a bit with the hissing sound, mine works well without hiss except when you put in unbalanced RCA, bring wifi signal nearby and maybe input a guitar / mic (dunno if this is my audio interface problem or the speaker itself). But i do have to say regarding the E5 sound quality, you were right. JBL might beat them in almost every aspect, but eventually i picked the E5 due to price differences in my country. They're good for monitoring although I suffer a tendency to undermix the lower end with it. Subwoofer would help in some ways. I have to say you bring in a great review and actually i've been waiting for someone to give a head to head comparison between E5 and E4.5. If i think twice regarding my wallets and their bang for the buck here, i would buy the E4.5. But I don't really regret it, the E5 is so much fun and enjoyable to work with. Hi! Hiss I am talking about is a product of internal electronics of monitors and it is usual to most active speakers. It is present even when no source is connected to speakers. If You use Your speakers to produce music than You picked the right speaker. E4.5 is not suited to producing as much as E5 is, it is more fun but less precise speaker. Thanks for a great review! Particularly thanks for mentioning “hiss” of which I was quite worried - knowing it is not worse than on other monitors makes my decision easier. I will probably go for Presonus Eris E5 because of my space restrictions. It is small and front ported, cheapest (in my country) and has great controls on the back – how often do you see adjustment of mids?! This brings me to “small” request. On one of youtube reviews I heard that Eris E5 can be adjusted to sound very similar to KRK Rokit 5 or Yamaha HS 5. If true I find this very interesting. Sound of Yamaha HS 5 is not appealing and sometimes (probably deliberately) sounds like old radio. This is probably because it is trying to be like NS10 and they say that “if it sounds good on NS10 it will sound good on anything”. For that reason I think it would be interesting experiment to try to get that sound from Eris E5. Do you think you could play a bit with acoustic tuning controls and make youtube video about it? Hi Tepriva! Eris E5 has the broadest range of adjustments in this class, and they are effective so You can shape the sound in many ways. E5 will also work well in smaller room due to resons You mentioned so I think in Your case it is a good choice. Yamaha is very peculiar speaker that I really did not like. I am sure there is a reason behind its sound, but clearly I am not the target customer ;) Regarding a Youtube video, for now I only shoot the videos in the netural settings as tone controls bring too much variables to the equation. Bose Companion 2 III, Mackie CR3 and Edifier R1280T comparison review. What is the best budget speaker under 100 dollars/euro ? Hi! I today's review, I will try to find an answer to a questions many of You may ask, "what is the best budget speaker at price around 100euro/dollars". To answer this question I gathered some of the most popular speakers on the market at this price point, namely Bose Companion 2III, Mackie CR3 and Edifier R1280T. Hopefully, at the and of this comparison, I will have for You a definite answer. Let the comparisons begin! Hi and welcome to my comparison/review of two popular budget multimedia speakers from Mackie and Edifier. Mackie CR4 is a budget multimedia speaker system with excellent studio credentials, Edifier R1700BT is a budget multimedia speaker system from Chinese maker - Edifier, budget multimedia speaker champ. Both of these cost about the same money (at least here where I live), and are similar in size and power. Is solid studio credentials an indicative of superior audio quality in this duel? Let's find out, shall we?? Reviewing Microlab B77 was prompt to me by one of my Youtube channel viewers that suggested it is much better than Edifier R1280T I reviewed recently, and even can compete with much more expensive speakers. After a bit of research around the web I decided I need to check if he is right, especially considering that they are cheaper than Edifier R1280T (at least here where I live). Without further ado, I present You my Microlab B77 speakers review.